government circles, just to satisfy their selfishness. At 9:50 a.m. some tinted buses with representatives of the Ministry of Culture and the Museum of the East reinforced by seven dozen investigators of the Main Investigation Department of the Ministry of Internal Affairs of the Russian Federation in Moscow and the staff of Rosgvardia (Russian Guards), with weapons and in full equipment, entered the territory of the Lopukhin Estate (where the Museum is situated). They smashed the front door with a sledgehammer, blocked the security and all the employees who were there, and then rushed inside. All entrances and exits from the buildings of the manor were also blocked. Once the keys to the premises were removed, the searches began. A formal reason for the visit of the Moscow law enforcement agencies and the conduct of investigative measures was an investigation of the criminal case related to the activities of Master Bank deprived of license by the Central Bank in 2013. 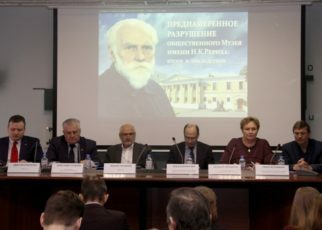 But in fact, the entire event was organized by the leadership of the Ministry of Culture with a single goal – to exert unprecedented pressure on the Museum of N. Roerich in Moscow, and to carry out, with the help of security officials, an illegal seizure of the highly valuable heritage of the Roerich family stored in the ICR (International Centre of the Roerichs founded by Svetoslav Roerich). 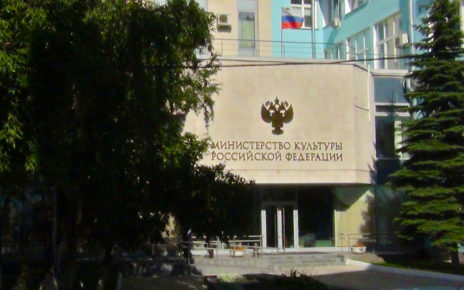 The action was an unprecedented PR move by the Ministry of Culture to discredit the ICR in the leading domestic media on the eve of the next court session on the deportation of the ICR from the Lopukhin Estate. What happened in broad daylight in our so-called “democratic” and “legal” state laid an indelible stain of shame on the Russian government and its law enforcement agencies. The country has not known anything of that kind in its recent history! According to the resolution on conduct of the search, the reason for the seizure of the Roerich heritage was the gathering of “items and documents” for the criminal case of Master Bank. That is, the seized legacy of the Roerichs allegedly became material evidence of the criminal activities of the bank which had never, in fact, acquired or transferred the Roerichs’ heritage to the ICR. 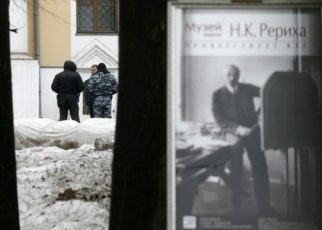 During the flagrant robbery, 200 meters away from the walls of the Moscow Kremlin, more than 200 paintings and graphic works by Nicholas et Svetoslav Roerich donated (!) 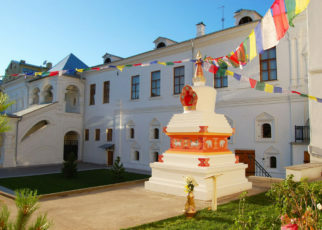 to the International Centre of the Roerichs by patron Boris Boulochnik, his wife Nadezhda Boulochnik, the Charitable Foundation named after Helena Roerich and others, – were seized as “evidence”. In the course of the search, the documentation of the ICR’s accounts department, construction department and archive was withdrawn. The investigator of the main investigative department E. Zaitseva supervising all this power capture, herself at her own peril and risk, made a decision to withdraw the paintings of the Roerichs generally not relevant to the time interval on which the investigative team worked. That is against the backdrop of the fact that, according to Russian legislation, these pictures in no way could be withdrawn, because they were not stolen, they were acquired and returned to their homeland from world famous auctions, where their provenance was checked! In addition, these paintings have never been the assets of Master Bank. After the act of giving, the Boulochniks-donors lost any rights to these cultural values, and paintings became the property of the ICR without any conditions in the donative documents! Mikhail Baklanov closely following the progress of the Master Bank investigation writes: “The Moscow Arbitration Court rejected the statement of the Deposit Insurance Agency (DIA) on the adoption of interim measures in the form of seizure of property of the former members of the management bodies of Master Bank in the amount of 24.6 billion rubles (03.02.2017)”. 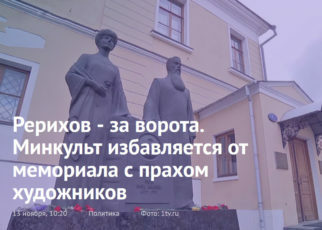 On February 16, the court again returned to this issue and again postponed to May 25 the consideration of the statement of the Deposit Insurance Agency (DIA).” Thus, no one has seized the personal property of the same Boulochnik yet. 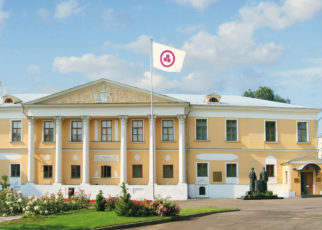 The property of the ICR remains its property, and the paintings donated by Boulochnik are in its possession on the basis of donative documents. The gifts were made without any restrictions on the part of the donor, were issued in accordance with the rules of the Civil Code of the Russian Federation, and no longer belonged to the donor. Hints of the fact that the pictures were acquired allegedly for stolen money for a long period of years (the court has not proved it yet) are, in fact, information noise to cover the true objectives of the withdrawal of paintings from the ICR. The material evidence in the current criminal case, which have been confiscated allegedly of necessity, are going to be studied by the authorities on the subject of whether there are any accidental traces of financial fraud of Master Bank in the pictures. Are they going to lie in an evidence storage chamber? No, such paintings of high value demanding strict storage conditions migrated immediately to the state Museum of the East affording appropriate conditions for them.” It is noteworthy that the investigative bodies initially had claims only on the last gift of Boris Boulochnik – the nine paintings by Svetoslav Roerich acquired at the New York Roerich Museum. They became the so-called material evidence in the case of Master Bank, yet in pre-trial order, although these pictures did not belong to the bank and, as soon as the documents were issued, became the property of the ICR! Thus, neither the state, nor even the depositors of Master Bank have never had any legal rights to these pictures. And it is unlikely that such rights may appear legally. Then what’s the matter? I think this is a reason for that the one who ordered it, gave an answer. And publicly. Because this is our heritage, and the paintings of Roerich are a world heritage. I like Roerich’s paintings – these are very emotional, philosophically saturated paintings. They have a historical component and a great train from the point of view of those who propagandize his philosophical doctrine. 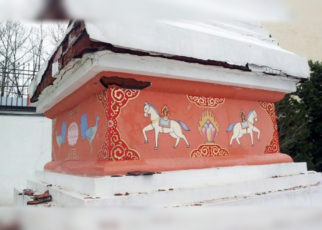 So I think that these paintings should not fall into the village of Mansurovo or somewhere in a “New Russia”’s castle, but they should remain in a public domain for visitors, for those who want to see these masterpieces” . In fact, a precedent has been set up, after which any Russian citizen or public organization that owns a valuable cultural heritage may lose their collection at any time. Then after the commission of “investigative” actions, they will be asked in court to prove that cultural values were acquired legally. 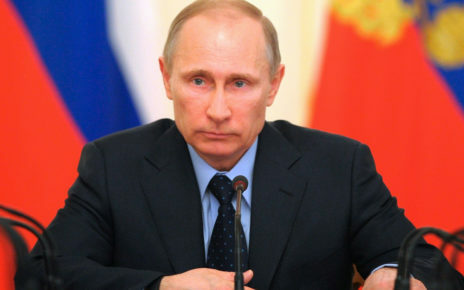 This will become an almost impossible task after the seizure of the legitimate documents (i.е. gift certificates, purchase and sale agreements and other securities that confirm the rights of the owner) by law enforcers. And more, “evidence” is sometimes lost from law enforcement bodies. And more, there can be fires, losses, repairs, relocations, reorganizations and so on and so forth. In other words: gentlemen collectors, take care of your collections, for tomorrow the police can come to you! And this is especially true in the absence of a clear legal framework for the circulation of cultural property in the country of the victorious democracy, which has been discussed in the State Duma not the first year, but things are still there. Such a situation is beneficial first of all to the Ministry of Culture, its experts and controlled structures like “Rosizo”. The latter most likely participated in the packaging and export of paintings from the ICR. In short, the situation with the ICR has clearly shown that in Russia the basic constitutional rights of citizens to private property are not observed. In the case of the ICR – the right to property of a public organization with its own museum and world renown in the field of cultural and peacekeeping activities. I fully agree with the opinion of Mikhail Tamoikin, as well as with the conclusion of Denis Vnukov who watched all day and all night behind the gates how the paintings were removed from the ICR. Here is his absolutely exact conclusion: “What happens gives only one answer to all the questions. This is theft! A usual theft covered by law enforcement agencies and high ranks from the Ministry of Culture” . “So far, only one thing is clear: this is a raider seizure of the ICR’s property, writes Mikhail Baklanov, although there are no final court decisions on this matter known to the public, and all cases of property relations between the ICR and the Ministry of Culture are under consideration. <…> Thus, the Ministry of Culture initially reserves the right to win such an unsettled court case and pre-concentrates the pictures in its state hands. With a view to painlessly leave pictures at the state without any right, having no real documents … “. This conclusion of the author, in my opinion, deserves special attention. Failing to win the ICR at the courts, the Ministry of Culture, and those who stand behind it, dared to capture the Roerichs’ heritage! It is the Ministry of Culture that coordinates the actions of all inspection bodies and law enforcement agencies. That is, the tax inspection, the investigative bodies and the Ministry of Culture all operate in a tight liaison. They jointly solve the raider task of the illegal removal of the Roerichs’ heritage from the ownership of an international public organization. In support of this, it should be noted that all the actions to remove the documents of the department of accounting and the archive of the ICR were led by the adviser of the Minister of Culture Kirill Rybak who started his career as a lawyer at the State Museum of the East and then found himself in the Ministry of Culture on the protection of this institution. It was he who insisted that the operational-investigative group working on the second floor of the ICR withdrew all the contracts of donation and acts on art objects which contained the last name of Boulochnik from the 1990’s till 2000’s! This assistant of the Minister of Culture V. Medinsky and his deputy V. Aristarkhov was supervising de facto the whole process. The donation agreements are international legal acts confirming the legality of the ICR’s possession of collection of paintings presented by the family of Boulochnik! That is why they were seized first. The removal and export of the main part of the Roerichs paintings from the ICR’s exhibition and funds was carried out, as well, under the leadership of K. Rybak. The name of this “herostrat” of the Ministry of Culture should remain for history. It was Rybak who was the brain of this monstrous action prepared in the bowels of the Ministry of Culture. Together with him, Deputy Director of the Museum of the East T.K. Mkrtychev, a representative of the Nicholas Roerich Museum in New York D. Popov (a former employee of the Museum of the East), a representative of the Central Museum of the Second World War A. Tikhonenko (Rybak’s assistant, a great friend of Rybak and the Museum of the East), and also V. Chernyavsky who cares for rewriting the history of the formation of the ICR’s Roerich collections, and some others actively participated in the raider capture of the ICR’s cultural values. According to the commentary of the Ministry of Culture, all of them acted as “experts” for the robbery of the non-governmental Museum named after Nicholas Roerich in Moscow. All the canvases of the Roerichs were handed over by investigators to T. Mkrtychev under a simple receipt which he hastily made by hand. None of the specialists from the ICR, its restorers or custodians, were allowed to participate in the procedure for the removal and packaging of the world-class masterpieces. Even a simple photographic fixation of the state of preservation of the world-class masterpieces was not made there! The ICR staff members were not present either during the removal of paintings from the Museum, or during their transportation to the Museum of the East. There was no question of any observance of the conditions for the storage of exported cultural property! Law enforcers handed over to the Museum of the East exactly what T. Mkrtychev, together with K. Rybak, considered to be necessary to withdraw from the picturesque ICR fund. Here, a corporate collusion between several departments and individuals committed to eliminate the ICR and its public Museum, as well as an illegal acquisition of its highly valuable collection, are obvious. T. Mkrtychev was never an expert on the Roerichs painting. In an interview with Channel 1 on March 10 this year, he said that he doubted the authenticity of some of the seized ICR paintings! The purest outrage and provocation. Why is this being done? The answer is obvious – not only to discredit the ICR, but also to prepare the ground for further sale of “unnecessary” and “not of value” for the Museum Fund of Russia paintings which can adorn the numerous villas of our today’s oligarchs tightly tied to the modern Russian government. The Roerichs pictures are not just things that have a huge financial value. These paintings are a reflection in color of the Roerich philosophy. Their loss is irreplaceable. The phrases that there were supposedly fakes in the ICR exhibition sound ridiculous and wild. The Museum of the East and the Ministry of Culture have been fighting the ICR for a number of years, precisely because of the philosophy of the Living Ethics which is the basis of the ICR’s exposition. So, for example, from the mouth of some police officers who conducted the search and fully supported the position of the Ministry of Culture the word “sect” and the wish that after their “measures” our “criminal” organization would be unlikely to continue its work repeated many times to the ICR staff . All that is despite the fact that a lot of outstanding figures of culture, science and politics in Russia have been acting as trustees, presidents and vice-presidents of the ICR for many years. Among them: the patriarch of Russian culture Dmitry Likhachev, diplomat Yury Vorontsov, Orientalist and politician Evgeny Primakov, Indologist and philosopher Lyudmila Shaposhnikova, president of the Academy of Arts of the USSR Boris Ugarov, academician Alexander Yanshin, academician Vladimir Lakshin, world chess champion Anatoly Karpov, actor and teacher Gennady Pechnikov, sculptor Zurab Tsereteli, conductor Yury Temirkanov, and many others. So, it was clearly felt that such a reaction of those security officials was pre-formed by the Ministry of Culture. The ambience during the search was extremely tense. We had to face repeatedly with the psychological pressure of the investigation department representatives who had no idea of where they came with the search. The actions of Rosgvardia and the investigators were tough. 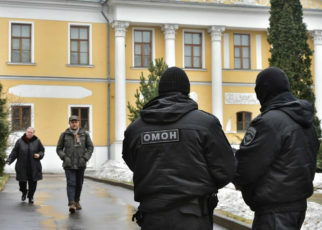 Thus, an employee of the ICR A. Prokhorychev refused to sign the resolution to conduct the search, demanded that the investigator wait for the lawyer and the Superintendent of the ICR, after which he was struck by the security officials and taken to the Department of Manuscripts of the ICR. The author of this article was banned from taking any photographs of what was happening and demanded to remove the footage already taken. Particularly tense was the moment, when we had to insist on making the necessary additions to the search report. Thus, for example, in their search record, the investigators forgot to indicate the main character in the search in the registration department K. Rybak; initially they did not let us familiarize ourselves with the resolution on the search; they did not allow us to compare the seized documents with the list in the protocol, nor to make their copies; they just did not read out our rights; they removed the lawyer of the ICR; they did not allow the head of the organization who was blocked in another building to proceed … Eventually they allowed to read the act, solely on my urgent request, and only after the search was completed, when I was squeezed out to sign the protocol! What did I see? In this document, which fit on two incomplete sheets, there were only general phrases and nothing concrete about the seized Roerich heritage. There was no list of the seized cultural property. But we are talking about the canvases of world level, which are not only Russian but also international cultural heritage. Everything was done in a hurry. The investigators were confused, they did not know each other well, nor the site on which they were to work. They had absolutely no idea where they came with the search. It did not seem to be a search carried out in a museum establishment, but rather in a provocative criminal firm producing illegal alcohol products. Most of the police agents believed that they were dealing with a criminal organization. I had to explain repeatedly that they were in a museum establishment, that in the main building and the wing there was a highly valuable legacy of the Roerichs. For example, the searches in the depository of the Museum and the scientific library of the ICR were conducted without the participation of the ICR representatives, not to mention the presence of the necessary “specialist” and the “museum worker” from the Ministry of Culture. The investigators did not have any specifications on the paintings, but K. Rybak did. He came with a list of paintings which actually duplicated the list of works located in the ICR which were preparing to be registered in the non-governmental part of the Museum Fund of the Russian Federation. This list of paintings was not certified by anyone. Just a printout without a ministry blank or a signature of an official. Thus, it was not an official document at all. During the search, I had a strong impression that K. Rybak was the main “expert” in both the Roerichs’ heritage and the Master Bank case. 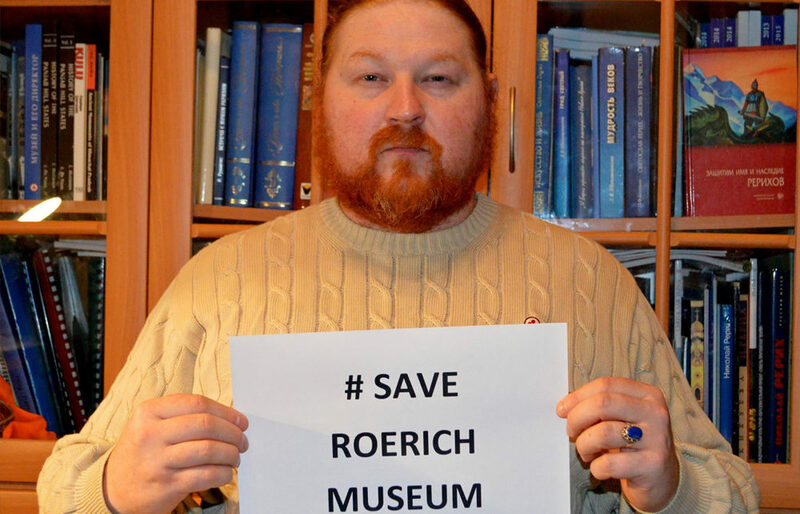 In the department of manuscripts of the ICR, K. Rybak (who does not have a specialized museum education) tried to seize the archival documents of the Roerich family. However, the staff members of the ICR G. Tesis and A. Prokhorychev convinced the investigator M. Voronin not to do so. It is also unclear, on what basis, at the insistence of Rybak, the documents of the Soviet Roerich Fund, which have nothing to do with the Master Bank case, were removed from the ICR Archive! As a result, the Center-Museum lost its historical documents, since making their copies was out of the question. This story, as they say, is generally from another opera. 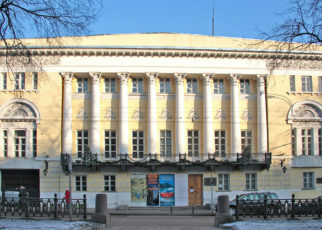 In fact, Rybak and Chernyavsky aim to rewrite the history of creation of the Soviet Roerich Foundation in favor of the position of the Ministry of Culture and the Museum of the East, in order to obtain a basis for the seizure of the entire Roerich heritage transferred by Svetoslav Roerich to the ICR (at that time it was called the Soviet Roerich Foundation) in 1990. A part of the ICR staff was raised by the police in the morning and, in fact, escorted to the Museum for investigative activities. Another part was blocked at their workplaces. The rest of the employees were not admitted to the Museum at all and spent the whole day outside the gates of the Lopukhin estate supporting the Museum and their colleagues. We knew about it and felt their support. At the gates of the old estate, people formed a real operational headquarters which tried to prevent the Roerich heritage from being taken outside the Museum. But this was anticipated by the OMON fighters (special police units of Federal Police) who stopped the public’s attempts to prevent the export of paintings. Also, on occasion, during breaks between investigative measures, it was possible to respond to calls from non-indifferent people from all over the country. 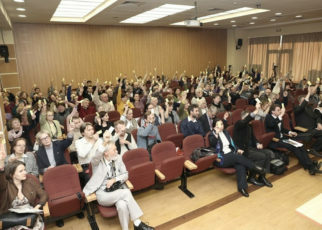 People expressed their indignation against the arbitrariness and tried to support. In this regard, I would like to thank everyone for their help. The walls of the Museum became empty … Ominous holes are gaping in the exposition… The faces of the representatives of the Ministry of Culture, the Museum of the East and the true customers who are not yet known to the public reflect the joy and the feeling of complete satisfaction. Our hearts are full of a deaf pain from the lawlessness and the bitterness of irreparable loss … But the herostrats rejoiced a day before the fair. They will necessarily answer for their destructive actions. The next day after the rout, the International Center of the Roerichs continued its work, despite the barbarous sacrilege committed by the Russian state in relation to the defenseless institution of culture. We all must declare to the whole world – SOS Culture! For the crime committed is not only of national, but of international scale! The case of robbery in the non-governmental Museum named after Nicholas Roerich in Moscow, with each passing hour, is gaining an ever greater international resonance. All that happened is quite comparable to the actions of the American destroyers of the first New York Museum of Nicholas Roerich. Then, as now, in this dirty act of destroying the exposition of the museum, state organs and various dubious characters took their part. Therefore, I fully support the position designated at the last ICR press conference  by the Direction Board of the International Center of the Roerichs, the trustee of the ICR A. Karpov, and the member of the Presidential Council for the Development of Civil Society and Human Rights I. Shablinsky, as well as the expert opinion of M.Tamoikin and M. Baklanov. I believe that we must do everything possible so that the international community got to know the true customers of the lawlessness created in our country, even if this requires recourse to international organizations, including the UN and UNESCO. 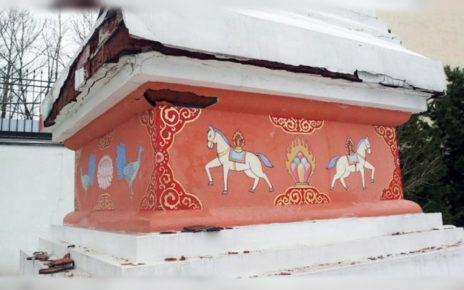 Otherwise, the most valuable paintings of the Roerichs seized from the ICR without any legal basis may become lost to world culture forever, while the Museum of Nicholas Roerich in Moscow can be further abused. The new world is approaching in new ways, and its advent cannot be stopped by modern destroyers of culture. We have something to fight for! We have something to save! At stake is the fate of the culture of our beloved homeland! Let us be united in spirit at this solemn and difficult hour!